Description: The upright bike carrier that set the standard for bike carrying flexibility and ease of use. Accommodates bike frames up to 3 1/8 in diameter. 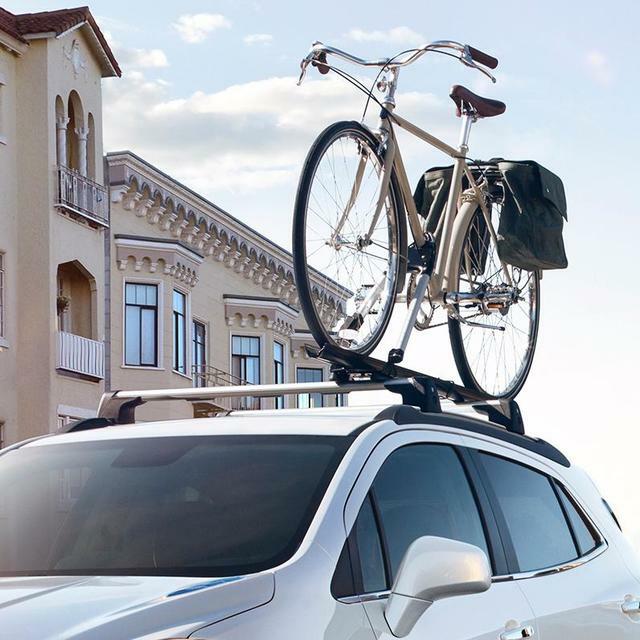 Requires crossbars or Thule Rack Solution. Non-GM warranty. Warranty by Thule®. For more information call 1-800-238-2388.. This product requires: 22950523, 19331869. The upright bike carrier that set the standard for bike carrying flexibility and ease of use. Accommodates bike frames up to 3 1/8 in diameter. Requires crossbars or Thule Rack Solution. Non-GM warranty. Warranty by Thule®. For more information call 1-800-238-2388.. This product requires: 23218583, 19352498. GMOutletParts.com by Ed Rinke operates one of the largest and most professional GM parts warehouses in the country. Our highly experienced parts team is available to answer all of your GM parts questions and ensure your satisfaction with every aspect of your purchase. As a owner, you want nothing but the best to be installed in your vehicle. If a part is not in stock (when your order status says ON ORDER) and must be ordered from the manufacturer, it usually takes 2-3 days to arrive to us and will be promptly shipped to you. Most of the orders are shipped complete within 2-3 business days. A few of the parts ordered from the manufacturer may take up to 5-6 business days to arrive and will shipped to you immediately. Whatever part you need, we're here for you. As a proud GM owner, you deserve to have your vehicle running at its peak performance levels. If you have any issues finding the parts you need, please contact our specialists at 1-800-702-4024. Please note Positions: Right mean Passenger side, and Left means Driver side. The material on this website is provided by a third party and could contain technical inaccuracies, shipping quote incorrect, inaccurate description, pricing, illustration or other errors. The illustrations in this catalog may use one illustration for both the left (driver) and right (passenger) side and are to be used as a guide only. Actual product may differ from what is shown. Please contact us for correct part numbers, part information, shipping quote or part availability prior to ordering. This website does not reflect our current on hand inventory. Prices on this website are for online purchases only. This site is not owned or operated by GM. GM is the world leader in automobile manufacturing. All GM genuine replacement parts are guaranteed to meet all of the manufacturers specifications and carry the same warranty as with GM vehicles. For more information contact our GM parts staff for assistance. Most of the illustrations contained in this online parts catalog are just simple renditions of the part and where it may be located on the vehicle, it is for reference only. There are many factors such as trim, color, and options that will not be depicted in the illustrations. We provide free parts fitment verification when you include your vehicle's VIN at checkout. This GM catalog is for reference only and does not guarantee availability of parts. GM Parts and Accessories are the best quality and are what came on your vehicle when new.